The past few years have brought intense controversy over questions about the legacy of the Confederate States of America—more than 150 years after the end of the Civil War. From Baltimore to New Orleans, from Charleston to Memphis, statues and flags have come down. In Georgia, the world’s largest bas relief, depicting Confederate leaders on the side of Stone Mountain, looms at the center of a debate about whether to chisel it into oblivion. Colleges and universities founded before the Civil War have wrestled with what to do about campus monuments to slave owners or the Lost Cause. At Emory, too, the question has been raised—what monuments to the Confederacy do we have? The answer, I believe, is none. Emory has little in the way of sculpture of any kind on either the Oxford or the Atlanta campus, and nothing that would constitute a monument or memorial to the Confederacy. The Few Monument—an obelisk standing in front of Seney Hall on the Oxford campus—was erected in 1849 to honor Ignatius Alphonso Few, the first president of Emory College. Dedicated by Few’s fellow Freemasons four years after his death from tuberculosis, the monument long preceded Southern secession. The Few Monument on a rainy day in Oxford, Georgia. Another obelisk stands about a hundred yards west of the Oxford College gym, in a small cemetery where at least thirty-two Confederate soldiers lie buried. They apparently died in the makeshift hospitals that occupied Emory College buildings after the Battle of Atlanta. The obelisk has no images or words other than the simple declaration that these were “Our Soldiers.” Federal soldiers who died in the same hospitals lie a mile away, across town, in a common grave in the town cemetery. Monument to the Confederate dead in the cemetery on the Oxford College campus. Common grave of Union dead in the Oxford town cemetery. On the Atlanta campus, the Haygood-Hopkins Gate honors two alumni who became Emory presidents—Atticus Greene Haygood and Isaac Stiles Hopkins, both of the Class of 1859. Haygood was a chaplain in the Confederate army, but the gate, erected in 1937, honors him and Hopkins as educators, not for any Confederate legacy. Haygood left the Emory presidency in 1884 to help develop colleges established for newly freed slaves, and Hopkins left Emory in 1888 to become the first president of Georgia Tech. The Haygood-Hopkins Gate at the entrance to the Druid Hills campus. Yet slavery and the Confederacy do appear in Emory history. All of the antebellum presidents, faculty, and trustees of Emory owned slaves. Many alumni and students fought for the Confederacy, thirty-five of them losing their lives. Three Emory graduates became Confederate generals—Edward L. Thomas, Class of 1846; James P. Sims, Class of 1855; and Reuben W. Carswell, Class of 1856. The sons of two Emory presidents, George Foster Pierce and Alexander Means, both fought in the Army of Northern Virginia. Professor Gustavus Orr, later the state school superintendent of Georgia, organized a Home Guard for Newton County in which he served as a captain, while President James R. Thomas served as a lieutenant. All of this history has been told. Names on Emory campuses remind us of it. Buildings at both Oxford and Atlanta as well as streets on the Atlanta campus bear the names of antebellum presidents Few, Longstreet, Means, Pierce, and Thomas. More than anything, these names link the modern campus to its roots in Oxford, celebrating the survival of a fledgling college rather than remembering the unlamented demise of a way of life or the defense of that way of life by secession and war. Yet Emory has honored two staunch supporters of the Confederacy. While Emory recognized them for other, extraordinary achievements, their association with the Confederacy complicates their legacy. The next installment will say more about the first of these two men. Autumn brought an intriguing email out of the blue from a young man named Joshua Daniel Few. A native of Montana, Josh is part of the extensive family that includes a signer of the United States Constitution (William Few Jr. of Georgia), a controversial pre-Revolutionary rebel against British taxation (James Few, hanged by the British after the Battle of Alamance, in North Carolina), a president of Duke University (William Preston Few, buried in Duke Chapel), and someone well known to Emory–Ignatius Alphonso Few, the founding president of the college. Josh now lives in South Dakota with his wife, Crista (a newly minted physician about to begin her practice), and their 13-month-old son, William James Few–the latest in a long and venerable lineage of William Fews. As I understand the family tree, Josh is the direct descendant of William Few Sr.’s brother, James Sr., not to be confused with William Sr.’s son James, the one who was hanged. William Sr. was the grandfather of Ignatius Alphonso Few. That makes William Sr. Josh’s great-uncle times eight, and I.A. Few Josh’s first cousin nine times removed. If I have it right. As the family genealogist, Josh had planned a week-long pilgrimage to Few family sites all along the East Coast. The capstone would come with a visit to Oxford. Josh kept a blog of their journey, and you can read it here. Thus, on a beautiful Sunday afternoon in November, my wife, Sara-Haigh, journeyed with me to Oxford to meet up with them. Joe Moon, the Oxford College dean of campus life, joined us on the Oxford Quad for a tour of Few shrines. First up was Few Hall, one of the two oldest buildings owned by Emory University. Originally the home of one of the two debate societies organized by Emory College students in 1837, Few Hall was constructed in 1851 with funds raised by the society’s members and honors President Few. Renovated and expanded in 2001, the building now includes the Tarbutton Performing Arts Center. The Fews examine Few close up. A short stroll across the Oxford Quadrangle brought us to the Few Monument, in front of Seney Hall. Dedicated in 1849, ten years after ill health forced President Few to resign, and four years after his death from tuberculosis, the monument was the inspiration of Few’s fellow Freemasons — some 600 of whom showed up for the dedication. The youngest Few, William, examines the monument to a distant ancestor. After a tour of the Quad, including a stop into the library and Candler Hall, we drove down Wesley Street to the house that Ignatius Alphonso Few built in 1836. Since 1889, it has been home to the presidents of Emory College and, after the move of the college to Atlanta in 1919, home to Oxford College deans. Gary Hauk, Joe Moon, and the Few family in front of the Dean’s House, the home Ignatius Alphonso Few occupied as president of Emory College from 1836 to 1839. At the end of a long pilgrimage to Few sites from Pennsylvania to Georgia, Josh pays homage at the grave of Ignatius Alphonso Few in the historic Oxford Cemetery. Besides the pleasure of meeting this young family on a beautiful autumn afternoon, it’s no stretch to say that the occasion offered the first opportunity to begin recruiting little William James Few to the Class of 2038. That year will mark the bicentennial of the first classes taught on the Oxford campus. Many will apply for admission, but let’s assume Few will be chosen. 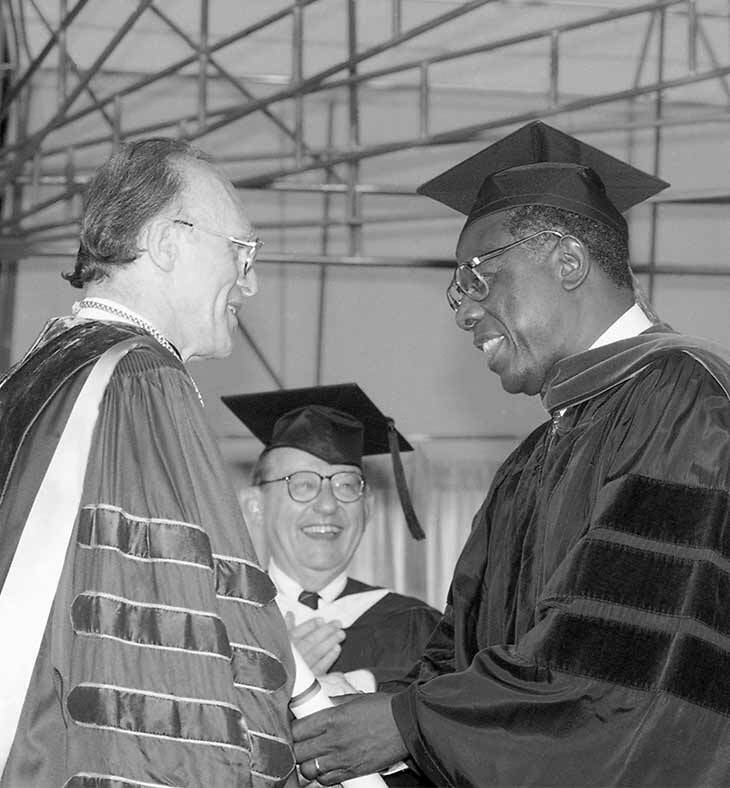 “Hammerin’ Hank” Aaron receives an honorary degree in 1995 from President Bill Chace and Board Chair Brad Currey 01H (center). The provost was draping a doctoral hood over the shoulders of Henry Louis Aaron—“Hammerin’ Hank,” the home-run king—at Emory’s Commencement in 1995. Somewhere nearby the ghost of President Warren Candler may have hovered in disbelief. Not only had his policy against intercollegiate athletics given way completely, but here was his beloved university honoring a professional baseball player, of all people, with the honorary doctor of laws degree, of all things. Atlanta’s hometown hero, though, did not just swat baseballs magnificently. He lived with dignity and courage in the face of racist vitriol during his run at Babe Ruth’s career home-run record (which Aaron broke in 1974). Throughout his life, Aaron aimed to break down barriers and make civil rights a reality. This, Emory said, was worth recognizing with a degree that honored the law as well as the man. As the university president read the accompanying tribute, the audience broke into applause at the line, “You showed good fences make good targets.” And thus, in awarding its highest honor to a man who hit balls over a wall, the university refreshed a tradition sometimes viewed as time-consuming and puzzling. But Emory at that moment also raised in many minds the question about how it decides who receives an honorary degree. Scanning the universe of memorable achievement and the great men and women who populate it, how does the university’s gaze alight on this scientist and this poet rather than that musician or that politician? More curiously, why this Nobel laureate in medicine rather than that one? Since the awarding of the first honorary degree by the University of Oxford, in the 15th century, the practice has implied a two-way exchange of esteem. We, the university, proclaim you to have earned a degree without all the study we normally require because you have done something great for humanity. You, in turn, elevate our status by associating with us. We are yours, as you are ours. You represent us as you inspire us. Recent history may suggest how this works. 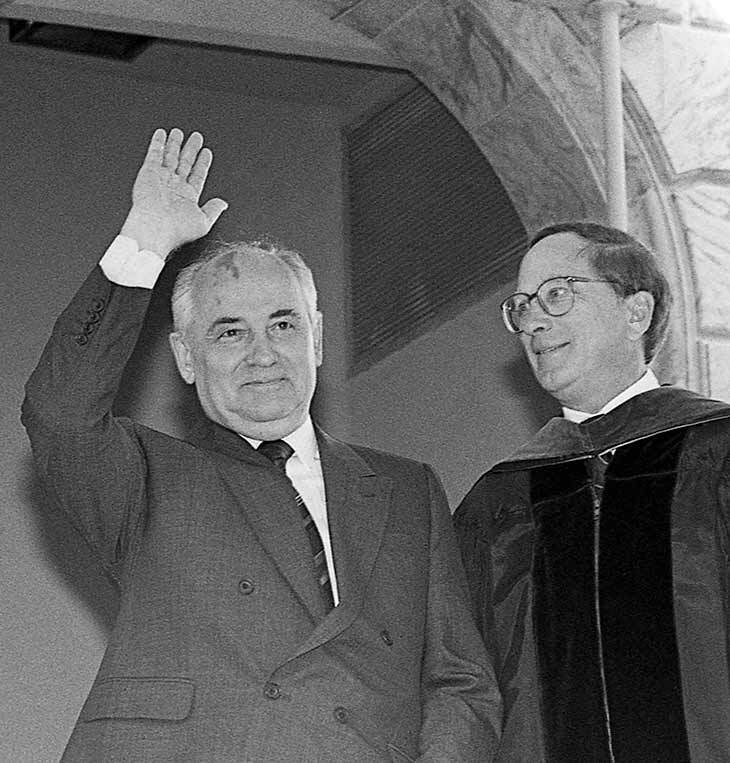 Emory was pleased, in 1992, to be one of only two US institutions to grant an honorary degree to Mikhail Gorbachev, whom Time magazine had recently declared the “man of the decade.” (The other was little Westminster College, in Missouri, where Winston Churchill had given his famous “Iron Curtain” speech.) Gorbachev had precipitated such change in the Soviet Union that he set in motion the end of the Cold War. The Emory Commencement at which he spoke provided the occasion for a mini-summit, as Gorbachev met beforehand with former President (and University Distinguished Professor) Jimmy Carter to talk about the work of The Carter Center as a possible model for the Gorbachev Foundation. Honoring a political rock star, Emory gained a lot of press. On the other hand, it can be tricky to recognize the best in their fields while requiring that their lives reflect the university’s mission and vision. Although the intense public interest in seeing Gorbachev required fencing the Quadrangle for the first time to preserve seats for the graduates and their guests, one faculty member complained that Emory was besmirching its honor by celebrating someone he considered an unrepentant Communist. Other faculty members have protested degrees for Mary Robinson, former president of Ireland; Ben Carson, brain surgeon and current secretary of Housing and Urban Development; actor and former California governor Arnold Schwarzenegger; and Wernher von Braun, the rocket scientist who advanced America’s race to the moon but had been instrumental in the Nazi war effort as well. It is difficult, however, to imagine protests against the earliest recipients of honorary degrees from Emory. The place was smaller then, the faculty largely of one faith if not one mind, and the students under strict parietal rules that left them well-disciplined. Emory awarded its first honorary degree, a doctor of divinity degree (DD), in 1846, at the seventh Emory Commencement (the sixth with actual graduates). The recipient was the Rev. 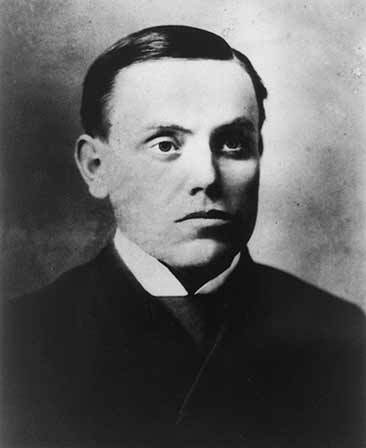 William H. Ellison, a Methodist minister and a leader in establishing higher education in Virginia, Alabama, and Georgia. He thus was typical of those whom Emory recognized throughout the 19th century for their contributions to the church and education. Indeed, many of the honorees (Oxford University prefers “honorands”) through Emory’s first seven decades were Emory faculty members and presidents. Two of those—presidents Alexander Means and Warren Akin Candler—received multiple degrees. Means, a medical doctor and minister, received the DD in 1854 and the LLD (doctor of laws) in 1858, even as Candler has the distinction of being the only person to receive three honorary degrees from Emory, which was also his alma mater. Things have changed. The current guidelines of the Honorary Degrees Committee note that only in “extraordinary circumstances” will it consider “persons who have spent the greatest part of their careers as members of the Emory faculty or administration.” Still, the university occasionally makes exceptions, as in conferring honorary degrees on more-recent Emory presidents Sanford Atwood (1978) and James Laney (1994), as well as Emory’s first provost, Billy E. Frye (2015). (In a nod to their contributions to the university, Elizabeth Atwood and Berta Laney also received degrees when their husbands did.) Most recently, Natasha Trethewey, formerly the Robert W. Woodruff Professor of English and Creative Writing, received the doctor of letters degree before giving the Commencement address in 2017. In the early days, when travel was more difficult, the conferral of an honorary degree required only a vote of the trustees. Yun Chi-Ho, the first international student to graduate from Emory and a national leader in his native Korea, could not travel to Emory to pick up his LLD degree in 1908. No matter—he still has his place on the roll of honor. Nowadays, except for the rarest of reasons—death being one of them—recipients of honorary degrees have to show up to receive them. 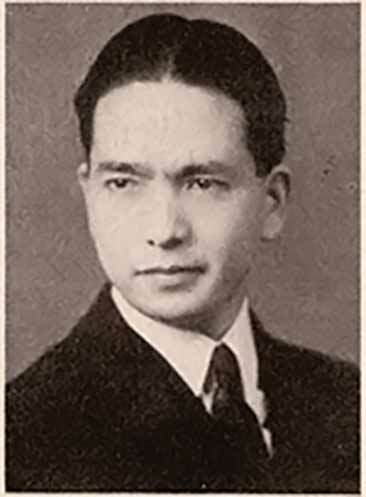 Kiyoshi Tanimoto, a 1940 graduate of the theology school, Methodist minister, and survivor of the Hiroshima atomic bomb who established the Hiroshima Peace Center, died just before the 1986 Sesquicentennial Celebration at which he was to receive his DD degree with nine other distinguished alumni. His widow came to Glenn Memorial for the convocation and accepted the honor on his behalf. At other extraordinary times, the university travels to the recipient. Sir John Carmichael, a Scottish businessman and longtime eminent supporter of the Bobby Jones Scholarship program, was in failing health when he planned to visit the Augusta National Golf Course for the 1994 Masters Golf Tournament. Emory kindly obliged his inability to return from Scotland for Commencement the next month and presented his degree at the Butler Cabin on the penultimate day of the Masters in the presence of that year’s class of Bobby Jones Scholars. Robert Woodruff, whose place in Emory history is unique in many ways, declined an honorary doctorate when the trustees first offered it, but he finally agreed to accept it 30 years later, on December 6, 1979—his 90th birthday. President Laney handed him his diploma during a small celebration at Woodruff’s Ichauway Plantation, where the gathering included former Atlanta mayor Ivan Allen Jr. Marvelous as an honorary degree may be, sometimes something else is called for. When His Holiness the XIV Dalai Lama visited Atlanta in 1995, organizers of the visit asked Emory to host one of the planned events. On short notice, it was impossible to work through the process of consideration by the Honorary Degrees Committee, consultation with the University Senate, and approval by the board of trustees. Instead, President Bill Chace commissioned the President’s Medal, to be conferred on distinguished university guests who have enhanced the prospect of peace or enriched cultural achievement. 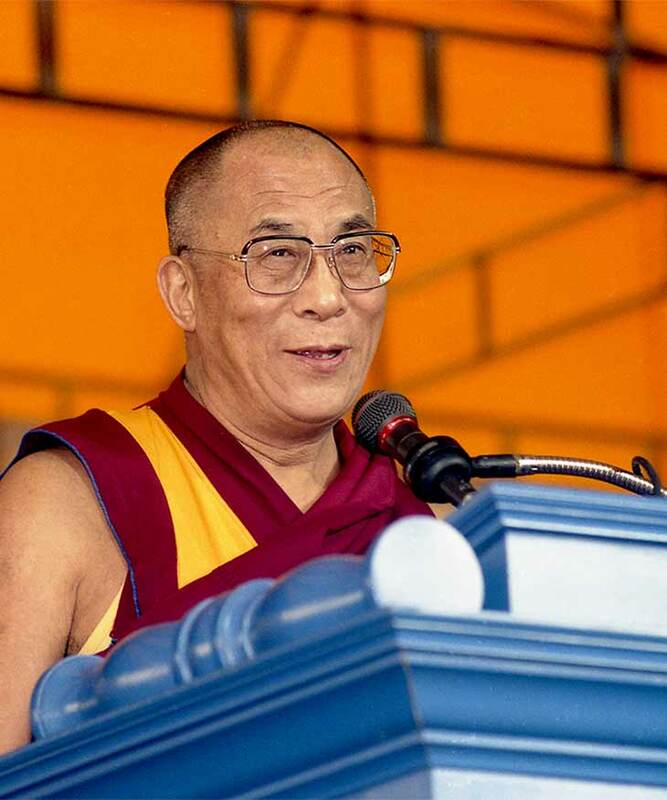 After bestowing the President’s Medal on the Dalai Lama in 1995, the university invited him back in 1998 to give the Commencement address, help inaugurate the Emory-Tibet Partnership—and receive the DD degree. Three other persons have received both an honorary degree and the President’s Medal when circumstances fit the conferring of one honor years after the other: Congressman John Lewis (medal 2000, LLD 2014); former President Jimmy Carter (LLD 1979, medal 2015); and public health superstar William H. Foege (ScD 1986, medal 2016). The university suggests its values and priorities with honorary degrees. 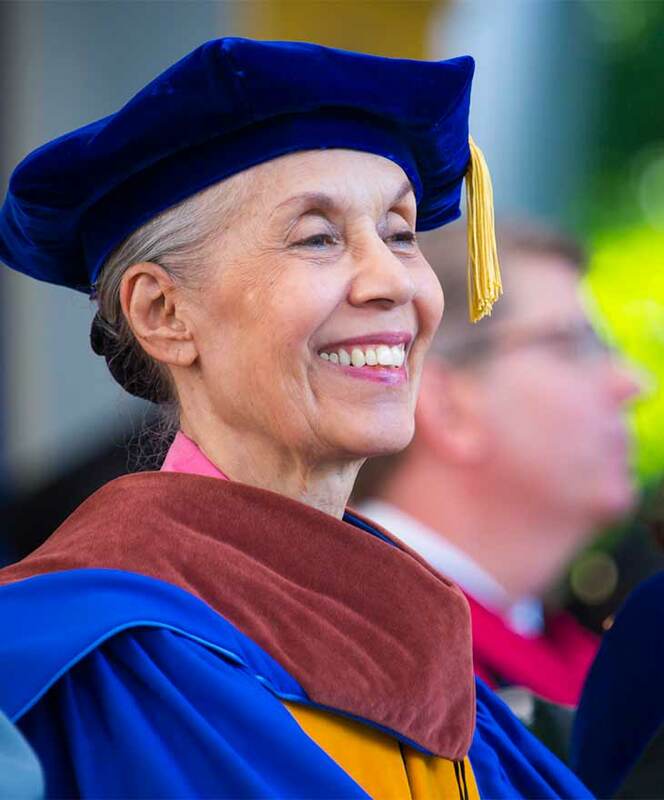 For instance, the 14 Nobelists with Emory honorary degrees include 10 peace laureates, two in literature, and one each in economics and medicine. Although public servants and philanthropic business leaders tend to outnumber all others, writers also abound among the honored—appropriate for a university with a top-ranked undergraduate creative writing program. The first writer honored was Joel Chandler Harris (1902), and the most recent was former US Poet Laureate Natasha Trethewey (2017). In between came Eudora Welty (1982), Ursula K. LeGuinn (1986), Athol Fugard (1993), Wole Soyinka (1996), Alfred Uhry (2002), Seamus Heaney (2003), Melissa Fay Greene (2010), Rita Dove (2013), and Salman Rushdie (2015). Other artists have included choreographers (Dorothy Alexander, 1986; Carmen de Lavallade, 2018); visual artists (Benny Andrews, 2007; environmental sculptor George Trakas, 2011); architects (Philip Trammell Schutze, 1979; Paul Rudolph, 1981; and Michael Graves, 2013); and musicians (Robert Shaw, 1967; Van Cliburn, 1994; and Robert Spano, 2009). The university also proclaims other commitments through honorary degrees. 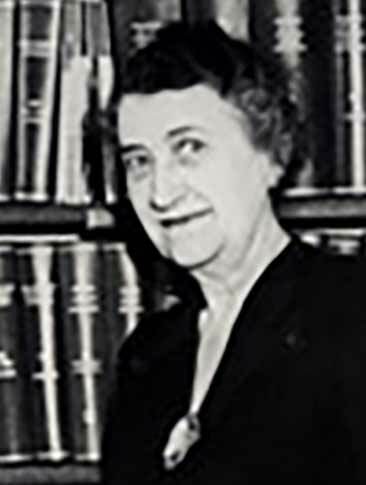 With an entirely male faculty and student body well into the 20th century, Emory took until 1930 to award an honorary doctorate to a woman, Tommie Dora Barker, the founding dean of the university’s library school, but that honor signaled that women’s intellect now helped shape the institution. Not until 1970 did the first African American receive an honorary degree—Benjamin Mays, the legendary president of Morehouse College. This was the same year that Emory College decided to establish what is now the Department of African American Studies. Occasionally, too, the university may confer an honorary degree to atone for its lapses. In 2000, Emory awarded the ScD degree to Leila Daughtry Denmark, a pediatrician who was then 102 years old and would continue practicing for another year. She had been the first female physician—indeed, the first physician—on the staff of Egleston Hospital when it opened on the Emory campus in the 1950s. She would live to the age of 114. Though the process of nominating, evaluating, and choosing candidates for honorary degrees has changed slightly during the years, the Honorary Degrees Committee of the University Senate always has in mind two overriding criteria: is the nominee at the top of his or her game (whether jurisprudence, physics, or baseball), and does the nominee play the game in a way that reflects the highest values of the university? For everyone from William H. Ellison in 1846 to the honorees in 2018, the answer clearly was yes. Note: This post has been updated. The original post indicated that planning for the current roundabout in Emory Village began just a few years before the roundabout was completed in 2011. An earlier plan, however, had been proposed by the Chace administration as part of the university’s comprehensive campus planning of the late 1990s. Two decades ago, during the administration of Emory president Bill Chace, the university worked with campus planners and traffic consultants to design a new intersection at the front gate of the university. A recommendation went forward to DeKalb County to replace the traffic light at the five-point intersection with a roundabout. More than a decade passed before the county and businesses in Emory Village saw the wisdom of the recommendation. In 2011, the county completed the current roundabout, and along the way Emory enhanced the Haygood-Hopkins Gate with a sweeping pair of marble walls to create a grand entrance to the campus. It turns out, oddly enough, that this concept was already half a century old when the roundabout opened, although no one may have known it at the time. Recently, as I looked through materials in the Campus Buildings and Landmarks Collection in the university archives, I came across three drawings created in 1960. No documents or explanation accompanied the drawings, so I can’t say what the intention was behind them. Did the administration seriously contemplate an imposing new front door to the campus? Was this design merely a suggestion from an interested landscape architect? Did other plans take precedence, leaving these renderings to be forgotten? What strikes me about the first drawing, below, is the plan for a building where the Boisfeuillet Jones Center would be constructed a quarter-century later. To the west of that “future building,” the architect suggested a memorial terrace in the space now occupied by the Oxford Road Building and its parking deck. More striking is the proposal for a traffic circle and a monumental “auto entrance” to the campus, shown below. The siting of the roundabout almost exactly matches the contours of the 2011 roundabout. It’s unclear from the sketch in the upper-left corner whether the Haygood-Hopkins Gate would have been retained as the central pillars of the two-way auto entrance, but the 2011 solution–which made the entrance one-way through the Haygood-Hopkins arch–works fine. Emory Village roundabout, satellite view from Google Maps. The third rendering, below, shows a similar but somewhat less grand entrance to the campus off Oxford Road, near the old Gilbert Hall. The university razed Gilbert (and its neighbor, Thomson Hall) in 2007 to realign the streets at that entrance and make room for the Psychology and Interdisciplinary Sciences Building. Someone in 1960 was thinking about making the campus more elegant. Unfortunately, succeeding decades would take the campus in a different direction, adding Brutalist-style architecture and impeded traffic patterns around the campus. It would take until the Chace administration — nearly four decades after these drawings were completed — before the university would begin attending to its built-up space with a similar concern for the stylish look and graceful flow of open spaces. When I was a freshman at Lehigh University, more years ago than I care to admit, my fellow frosh and I took a survey that the Cooperative Institutional Research Program (CIRP) has been administering to first-year students since 1966. It’s a useful tool for studying how students at American colleges and universities have changed over the decades — not only in terms of income levels, ethnic and racial backgrounds, and similar measurements, but also in terms of attitudes, aspirations, and aptitudes. I’ve been thinking of this in light of Emory’s United Methodist affiliation and the latest data on religious affiliation of Emory students. Such language neatly fit the vision of John and Charles Wesley, who sought to blend “knowledge and vital piety.” Methodism launched scores of colleges in the United States out of a faith that education would improve the soul as well as the mind. In many ways, of course, the founders in 1915 understood our “democratic institutions” differently than we do today. Jim Crow laws still prevailed in the South, and women would not have the right to vote in federal elections for another twenty years. Similarly, what it means to be “profoundly religious . . . without being narrowly sectarian” has changed. In those days, it meant that this Methodist university would admit students without regard to whether they were Presbyterian, Baptist, Episcopalian, or even Catholic or Jewish. It would be a long time, however, before the Emory Christian Association, formed by students in the 1930s, would be renamed the Emory Religious Association to reflect the growing religious diversity of the university. Nowadays, a very vibrant interfaith program run by the Office of Spiritual and Religious Life brings together students from dozens of religious persuasions. Cannon Chapel is the scene of Muslim Jumah prayers on Friday afternoons, Jewish observances on high holy days, Catholic masses on Sunday mornings and evenings, and ecumenical Protestant worship. The latest data for Emory undergraduates — from the fall of 2017 — indicate that Methodism no longer outnumbers other religions on campus, and in fact Methodist students are not even the most numerous among Protestant Christians. The chart below tells the story. As matters of religious conviction continue to infuse our national and international politics and determine the worldviews of most of the world’s people, it’s a fair question to ask whether Emory continues to present itself as a place of scholarship and inquiry where the study and practice of religion also matter. Emory is not a Methodist Notre Dame or Georgetown or Brandeis, where the institution’s religious identity is as well known as its scholarship and teaching. Still, the Candler School of Theology (the world’s largest United Methodist seminary), the groundbreaking Center for the Study of Law and Religion, and pioneering efforts like the Interfaith Health Program in the Rollins School of Public Health and the Journeys of Reconciliation sponsored by the Office of Spiritual and Religious Life go a long way toward that blend of scholarship and faith imagined by Emory’s founders. The most recent CIRP survey turned up no sign of Reformed Druids at Emory, but I plan to keep my eye out. One is likely to be along any time, and I suspect that I’ll have much to learn in our conversation. Leafing through old photos in the archives, I often find it difficult to identify their places and dates — not to mention their many anonymous faces. Occasionally the photo backs will have that information, but most of the time there is nothing. And sometimes what I do find on the back of a photo creates more puzzles than it solves. Shot sometime in the late 1800s, the photo has no identifying inscription. The fancy wood trim on the porch, however, resembles the trim on a house that appears in Erik Oliver’s book about Oxford in the Images of America series (Arcadia). Professor George W. W. Stone, one of the earliest graduates of Emory College and for decades afterward a member of the faculty, owned this house, which passed down through the generations of his family. The Stone House as it appears in “Images of Oxford,” by Erik Oliver. Both clapboard houses have the same wood trim around the porch, but you’ll notice that the house behind the students has more windows than the Stone House. Actually, the house with the students more closely resembles the front of the President’s House, shown below and in this “Emory History Minute.” The President’s House now serves as the official home of the dean of Oxford College. The number of windows matches those in the photo with the students, and the porch trim is the same — perhaps made by the same craftsman, as the houses were both built in the 1830s. But the wings of the President’s House, added in the 1840s, don’t appear in the much later image with the students. The roof line in the image with students also lacks the dentils that appear under the roof line of the President’s House. All very curious. So yet another house enters the mystery. Alexander Means bought Orna Villa, his Oxford house, some eight or nine years after it was built in 1825. The house has the right number of windows, but unless the photo was taken on the back porch, Orna Villa’s front is very different from the front of the house in the students’ photo. For me the evidence is inconclusive—I can’t tell where those students posed for that photograph sometime around the turn of the nineteenth century to the twentieth. But I do take one lesson from these photos. Any of us who still actually print photographs and collect them in albums or drawers should always take a minute to write on the back their dates and locations and the names of the people in them. I’m going to my collection with a Sharpie right now. In a more rustic era, a variety of simple structures like the one below graced the Emory campus, lending the place an air of a Boy Scout camp or a Civilian Conservation Corps site. Notice the tracks running past it. I was reminded of this image a couple of weeks ago when Jim Morey, English professor and resident of Druid Hills, wrote to me with a question about something I had posted in a brief story about the original Druid Hills campus. The map in that post is one I pulled as a screenshot from Google Maps. Jim noted the “Emory Trolley Line Substation” in that image and wondered whether that referred to the small brick building at the corner of Oxford Road and Eagle Row. You can see that notation on the map below. There is, indeed, a Georgia Power substation on that corner, and aerial photos suggest that the small red-brick building in that area dates from the late 1940s, while the high brick wall behind it, surrounding the large steel structure and high-tension wires of the substation, may be a somewhat later construction, or may have been enlarged as the demand for power in the neighborhood increased. It’s interesting but odd that Google Maps would identify that space with the Emory trolley! It’s true that until about 1947, a trolley ran from Briarcliff Road along the Byway to Oxford Road and then to a stop near the Emory Village intersection. There — at about where Chipotle and Romeo’s Pizza now share a building — the trolley reversed direction and returned to Atlanta (this was long before Emory was officially part of the city). The route appears as a red line in the map below. The location of the little shelter at the trolley stop also appears on a campus map from 1940-41, below. That trolley stopped running in 1947 — coincidentally, the same year that Gilbert and Thompson residence halls were constructed near that corner. Perhaps the small brick structure for the substation went up at the same time. It’s fascinating to imagine that recent decisions by Atlanta, MARTA, and Emory might one day bring back to Emory light rail reminiscent of the trolley. But the log cabin likely will remain a thing of the past.